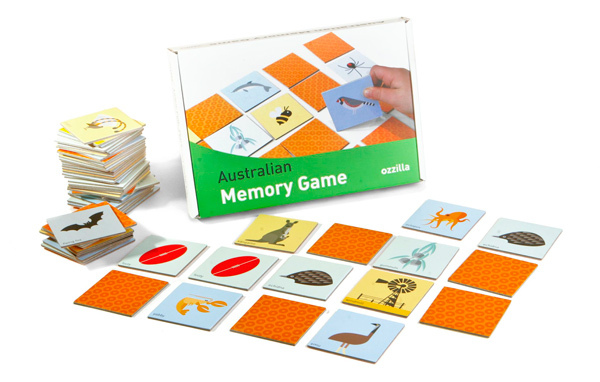 Ozzilla, Ozzilla, Ozzilla, oi, oi oi - Australian toys and decor to get excited about! Ozzilla, Ozzilla, Ozzilla, oi, oi oi – Australian toys and decor to get excited about! I’m no big fan of Australiana. Call it a big, fat case of cultural cringe, but there’s always been something inherently daggy to me about toys and other things emblazoned with kangaroos, koalas and the like. But stone the flammin’ crows, if Ozzilla hasn’t changed all that. 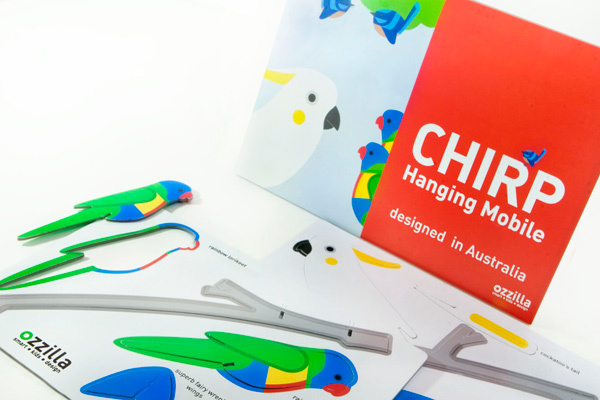 In fact, I’m finding it very hard not to bust out a chant of “Aussie, Aussie, Aussie” (you know the rest) because this new Melbourne-based company has achieved the nigh impossible – a collection of stylish toys and other wares for kids with Australian animals and themes at their core. And they’re educational too. I promise, you’ve never seen toys like this before. Yep, there’s kangaroos, koalas and cockatoos a plenty, but kitsch? Not on your life. I’m digging Ozzilla’s Australian Alphabet wall frieze (pictured top), where A is for ants, B is for barbecue, F is for football and P is for pie (tomato sauce optional). There’s a Marine Alphabet version too, with twenty-six fishy friends that go from Albacore tuna all the way to Zebra lion fish. Cool. 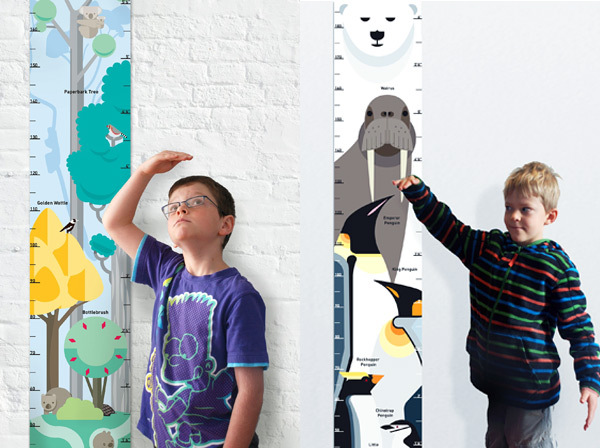 Chuck in a memory game, constructable flashcards in alphabet or number sets, plus sweet-as height charts (are your kids as tall as a paperbark tree or are they more a bottlebrush?) and the cutest hanging mobiles you’re likely to find this side of Uluru, and you have an Australiana collection that makes you proud to be an Aussie! So how did Australiana get this cool, you may be wondering? It could be because the boys behind Ozzilla – Dave and Cris – have an impeccable background in design. It shows in the colourful, funky graphics they created, then used with such flair throughout the range. 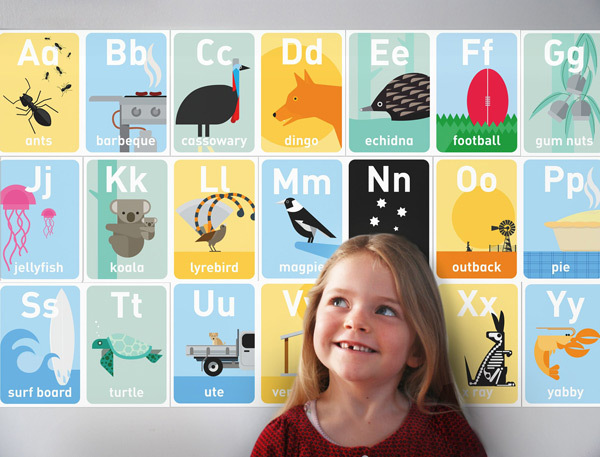 It’s not just good looks though – the flash cards and games have been designed with input from teachers to help teach kids their alphabets and numbers with a distinctly Aussie flavour. 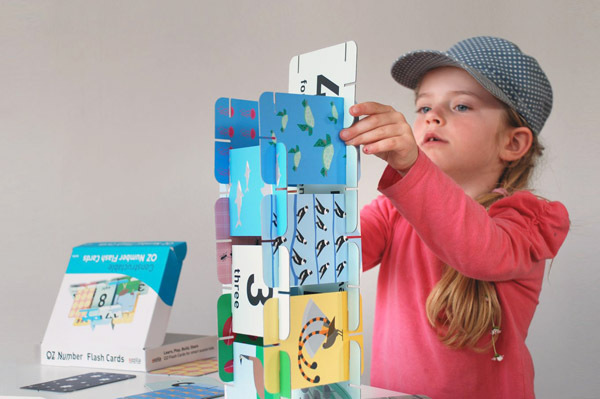 The constructable flashcards too are very original, allowing the kids to build tall towers and other structures after the work is done – talk about making learning fun! You can buy online direct from Ozzilla or peruse their list of stockists to find one near you. Prices start at $25 and items are packaged beautifully and designed to be easily postable too so they make perfect gifts for little relatives and friends overseas. Oh, and another important side note. All the products are made here in Australia or over the ditch in New Zealand. For more cool Australian-themed souvenirs and toys that won’t make you cringe, check our previous posts on toy Melbourne trams and Sydney ferries from Make Me Iconic.